Reliance is a telecom company which believes in the concept of revolution rather than evolution. It was one of the first companies to provide India with mobile phones and the first company to make incoming calls free in India. Mr. Mukesh Ambani’s company took the modern telecom industry by a storm by launching the Reliance Jio 4G services on 27 December 2015. The cheap and efficient Jio 4G data service saw India spear from the 155th position to the first position in terms of the daily data consumption. Less than a year after the launch of the Jio services, Reliance is back with another revolution, The Jio Phone. The 4G enabled VoLTE supporting phone was announced at the company’s Annual General Meeting by RIL chairman and MD Mukesh Ambani. The JioPhone is packed with a lot of features, but the most interesting thing about the phone is that it’s essentially free. The buyers of the phone will be required to pay INR 1500 as a security deposit, which is refundable after a period of 3 years. This phone is bundled with the Jio 4G & VoLTE services and aims to provide access to the people who previously couldn’t afford the technology. 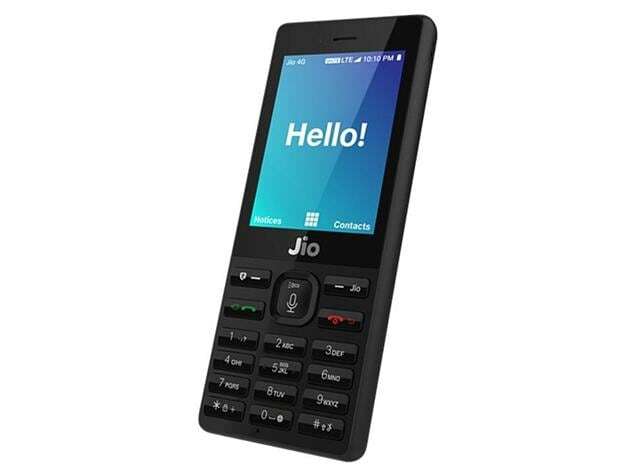 Another additional feature of this device is a specific cable which would enable JioPhone users to stream the Jio content like JioTV on their TVs, provided they opt for the INR 309 plan (Details mentioned later in the article). A candy bar design with an alphanumeric keypad. A 2.4-inch display with QVGA display. KaiOS OS, based on FireFox OS. Functionalities like Flashlight, FM radio. Support for 22 Indian languages. A panic button to send the last known location via SMS. The basic monthly pack on the JioPhone bears a tariff of Rs 153 and promises 500MB of high-speed data (after the limit, speed will reduce to 128kbps) every day and free VoLTE based voice calls and SMS. A better plan in terms of value and duration is the Rs. 309 plan, which offers 1GB of 4G data daily with other features being similar to the above-mentioned plan for 56 days. The JioPhone also has short duration plans at Rs 24 (2 days) and Rs 54 (7 days), which offer the same calling and data benefits. Reliance will start a beta test period for select users from August 15. The process of pre-bookings will begin from August 24 through the MyJio app and local retailers, featuring a first-come first serve basis. The phones are likely to be available to the general by September.